Chocolate Macadamia Nut flavored coffee features a Double-Dutch chocolate overtone with a sweet and subtle, buttery addition of macadamia nuts. 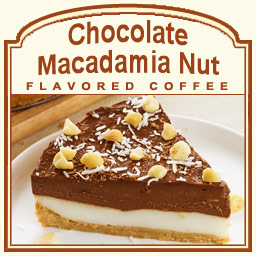 If you like your chocolate flavors to be silky smooth, this Chocolate Macadamia Nut flavored coffee offers a splash of French silk cream flavor�making the perfect touch of chocolate and nuts infused together! With only 2 calories per cup, these Arabica beans and burst of flavor offer you the most decadent blend of macadamia nuts and chocolate. A heat-sealed valve bag will ensure the freshest coffee that is freshly roasted on the same day it ships. 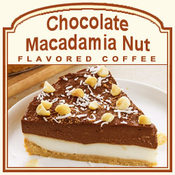 Let the suave, buttery flavor of the macadamia nuts wash over you with this chocolate mix � indulge your palate with this Chocolate Macadamia Nut flavored coffee!